Our product range includes a wide range of motorized multi louver dampers, multi louver damper and multi louver dampers. These are Motorized Multi Louver Dampers with Direct Mounted Actuator which operate in unison to offer a smooth flow control of Blower Air. These are typically suitable for Industrial applications and mounted in ducts. These units are with a sturdy sheet metal construction suitable to handle large quantities of Air and are mounted at the Suction or delivery side of combustion air blowers. The operating actuators are directly coupled to the Damper shaft. This eliminates the linkage arrangement and thus the relatively tedious linkage settings. The end limits can be set by means of adjustable limit switches inside the actuator. Sturdy Sheet Metal body. Louvers are provided with pressed ribs to provide adequate stiffness. The shafts of all the Multi Louvers are supported between Ball Bearing at both the ends. This reduces the frictional torque required to be overcome by the actuators and ensures a smooth operation. The Ball bearings are enclosed type and ensure that no lubrication is required during its lifetime. Actuators with suitable torque and Operating time is provided as an actuator for achieving the desired control over 0 to 90 degree travel of the motor. Actuator is provided with either 4-20mA, 2-10V dc or SPDT floating control input Actuator is available in 230 or 110 VAC power supply Actuator is directly mounted on the Multi louver damper shaft. Actuators have an IP-65 degree protection hence suitable for weather proof applications. Position Feedback available in 4-20mAor 2-10Vdc (field configurable) for the models with 4-20mAor 2-10Vdc control input. Auto declutchable Manual Hand wheel is provided for operating the damper by in event of power failure. Visual indicator provided on the actuator to indicate FULL OPEN/ FULL CLOSE position. Dampers in SS construction available on request. Operation: Directly coupled to damper shaft. : MOC in SS304 available on request. :Higher sizes are available in direct mounted actuator versions. : Manual knob operation for specific model instead of hand wheel. 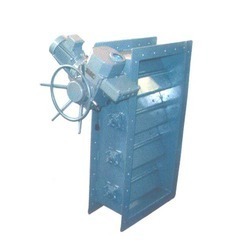 We are the leading manufacturer of 100% sealing efficiency multi louver damper. We have in our range impeccable Multi Louver Dampers. Complying with the defined parameters of the industry, these dampers are ideal for heat ventilation and air-conditioning systems. 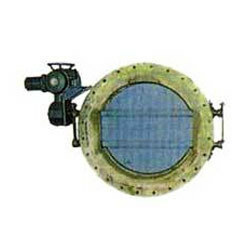 These dampers are provided with proportional controls that are used for controlling the flow of air or gas in both moist and dry environmental conditions. We also offer a flap that is normally closed and opens up whilst there is a rise in the temperature levels. Looking for Multi Louver Dampers ?